Following its widely acclaimed inaugural edition, the groundbreaking Art Wynwood Fair, enthusiastically embraced by the international art dealer community, Miami and the Wynwood Arts District will return for its second year during Presidents Weekend February 14-18, 2013. 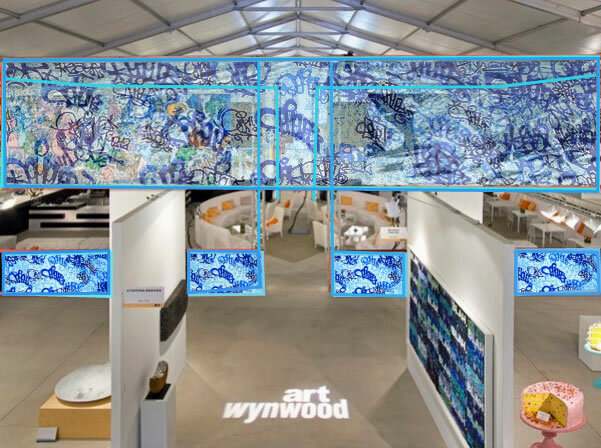 Art Wynwood will take place in the spacious 100,000-square-foot Art Miami Pavilion, which attracted more than 60,000 attendees during the 2012 edition of Art Miami. Guests at the exclusive VIP Preview on Valentine’s Day will experience a First View of the highly anticipated Art Wynwood at this private reception. It’s the first opportunity to acquire some of the finest pieces of contemporary art from 70 top international galleries before the Fair opens to the public. VIP guests will enjoy cocktails and hors d’oeuvres from 6:00 pm to 10:00 pm. Showcasing a diverse range of fresh and edgy works by established and emerging international contemporary artists from more than 13 countries around the globe, Art Wynwood continues to shine a spotlight on Midtown Miami and the Wynwood Arts District as a flourishing international cultural destination and the epicenter of Miami’s art, fashion, design and culinary communities. A main feature of the 2013 Fair will be the highlight of street art, murals, pop surrealism and other genres from the contemporary underground movement exemplified by two very special projects by Wynwood Walls including a stunning wrap around installation suspended above the VIP Lounge by famed artist Jesse Geller courtesy of Goldman Properties, in honor of the late Tony Goldman. In addition to the installation by Jesse Geller, Goldman Properties will also present a curated exhibit featuring specially commissioned lenticulars with the original paintings by selected artists of the Wynwood Walls installed in the pass through areas of Art Wynwood. Artists participating include: Aiko, Ron English, Logan Hicks,Futura, Swoon, Kenny Scharf, and How&Nosm. Art Wynwood is generously sponsored by its Official Luxury Real Estate Partner Christieâ€™s International Real Estate as well as Superyachts.com; JW Marriot Marquis Miami; Hotel Beaux Arts Miami; Turon Travel; Greater Miami Convention & Visitors Bureau; and supported by; Miami Art Dealers Association; Wynwood Art Dealers Association; Goldman Properties; Wynwood Walls; db Bistro Moderne; Joeyâ€™s; Wynwood Kitchen and Bar; Bakehouse Art Complex; SociÃ©tÃ© Perrier; The Miami Herald; MutualArt.com; Hyperallergic; WLRN; IRREVERSIBLE; Balthazar; Haute Living; Art Nexus; The Art Newspaper; Artinfo; Arte Al Dia and Midtown Miami.